Service Spotlight: Small Hole EDM Drilling | KLH Industries Inc. Most modern EDM drilling machines are CNC-controlled, few, however, are actually mounted on a CNC mill. By retrofitting an EDM driller onto a CNC mill, KLH Industries offers multi-axis Micro Hole EDM Drilling on parts over 1,800 lbs and in excess of 40" long. KLH efficiently drills small and micro holes through a variety of metals: stainless steel, titanium, brass, platinum, gold, and anything else that is electrically conductive. In fact, EDM can drill through 1" of hardened metal in less than a minute. Due to the low machining force, EDM is also suited for drilling on delicate electro-conductive materials, such as graphite and carbide. Medical suppliers utilize small hole EDM drilling not only for the variety of materials processed, but also for the burr-free finish. The spark erosion process leaves clean, accurate holes on surgical tubing or hypodermic needles. 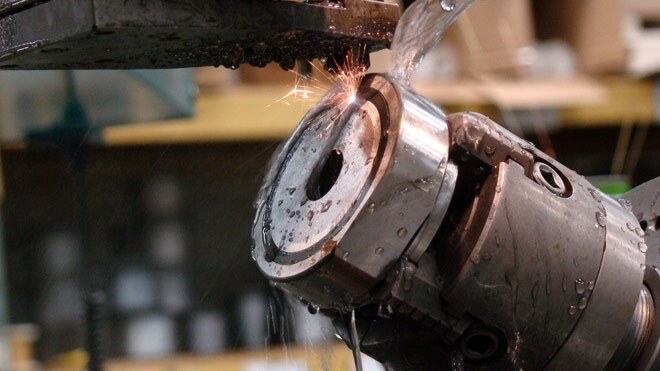 The curved or angled surfaces on aerospace turbines are easily drilled using EDM. Due to torque pressure, CNC twist drills tend to walk while cutting angled surfaces. An EDM electrode never contacts the workpiece, reducing machining force and ultimately maintaining alignment and concentricity. Similarly, expensive molds with hundreds of hours of machining time are less of a risk on an EDM driller. As with all electrical discharge machining, EDM drilling does not induce stresses into the part. Holes that were in location during drilling, stay in location. Although EDM drilling has many direct applications, it is also complementary to other manufacturing processes. A common support application of EDM drilling is to create start holes for wire EDM machines. Since both process are types of electrical discharge machining (EDM), it is often more economical to use this combination for hardened materials. Additionally, small hole EDM drilling can turn a CNC catastrophe into a mere inconvenience. Even the most competent and experienced CNC technician can fall victim to a faulty tap or drill. If the unpredictable happens in a mold or turbine, leaving a broken tap is not an option. EDM drilling is a reliable way to "burn out" broken drill bits or taps without any damage to the existing hole or threads. Simply put, small hole EDM drilling is for companies looking to minimize drilling risk with reliability and accuracy.